This is not a blog about DISD. I was in fact thinking of how I should write more today, but came up blank. THis email from Dallas Kids First, however, was in my email inbox (from last week) and I thought it was worth posting. Hopefully I can remember to be slightly more active with this site… We shall see. Regardless, if you live in DISD, please vote in the elections next week. Why? See below. Friends — The Dallas public school system is embarrassingly deficient, and although most of us care a lot about great public schools, it’s hard to know how to plug in and make a meaningful difference. I’ve learned a lot about DISD over the last year or so, and I thought you’d want to know about three specific opportunities that are easy to fulfill, timely and actionable. They give us all a chance to play a meaningful role in the progress that’s about to sweep over Dallas, and I hope you take advantage of them. 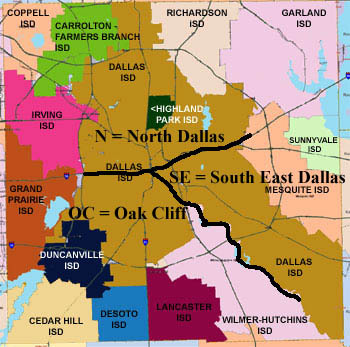 …some “lessons learned” about the Dallas public school system. The future of Dallas depends on our ability to generate productive graduates, and there’s no way to sugarcoat the fact that we are failing miserably. Only 10% of DISD’s students are college-ready, and with an average SAT score in the mid 800s (bottom 25% of all U.S. test takers), we simply aren’t generating the human capital needed to compete against other cities. Dallas ISD significantly underperfoms other Texas districts like Houston, Austin, El Paso, etc. And more importantly, low-income kids in Dallas are trapped in our worst schools. Dallas ISD has some “pockets of strength”, but we can’t hide behind a few bright stars. As a community, we can do better. Many of the anchors in the Dallas ISD debate are woefully inadequate. I’ve interviewed every person running for school board right now, and there are huge opportunities to increase the caliber of people on our board. Want an example? Bruce Parrott has been on the board for three years, hasn’t sponsored a single student-related policy, can’t remember much less explain why he has consistently supported the status quo, and has conflicting positions on key board issues like staffing and evaluation. Check out his voting history: http://www.dallaskidsfirst.org/uploads/9/2/0/2/9202227/supplemental-and-source-material-d3-2012.pdf Another candidate, Damarcas Offord, is a 20 year old who’s never had a job and has consistently refused to explain or even outline any positions on school board issues. Wouldn’t be a big deal if both candidates weren’t endorsed by the largest teacher ‘union’ in Dallas, but they are, and each of them has a decent chance of winning with only 1% voter turnout and margins of victory often around 200 votes. My point is: Reasonable people who genuinely care about the future of Dallas and the kids that live in our city can make a huge difference. By taking easy steps like the ones outlined below, we can show these people that the stakes are too high to allow Dallas ISD to be a sideshow. Dallas ISD is a tough place to work. No wonder it’s hard to get great staff members to stay. Want to know why? There’s no functioning human resources department. What organization with 20,000 staff members can function without an HR department? And since there’s no functioning HR department, great teachers and principals aren’t rewarded, promoted or developed. Poor teachers and principals aren’t developed either, and it can be difficult to get them out of a district since our evaluation system is a total joke. Ask any DISD teacher about their last PDAS. This is just one example of how broken fundamentals are incredibly obvious to anyone who’s genuinely trying to solve problems.We’ve made a lot of progress recently thanks to a handful of great board members and an effective interim superintendent. All signs suggest that the new superintendent is a rock star who will drive progress in areas like HR, but it’s important for all of us to appreciate that our issues are totally fixable. This isn’t a hopeless situation. DISD can consistently generate students who are ready for college and/or the workforce, but it’ll take a community that demands more and some good leaders. A big group will be walking in East Dallas neighborhoods tomorrow to “get out the vote”. If enough people come, there will be a drawing for a free ipad, followed by an after party at Good Friends. …a perfect opportunity to get a lot of mileage out of a Saturday morning. Like, follow, share and comment on DKF’s activities to increase awareness across Dallas. All three of these opportunities are extremely easy and would require minimal effort and resources. I’d love to plug you into deeper opportunities if you have the time, energy, passion, money, etc. but regardless, I hope you’ll consider taking advantage of the three opportunities above.